post-abortion programs, it does not insist (or even suggest) that a conversion to Christianity and/or the forgiveness of Jesus are required. 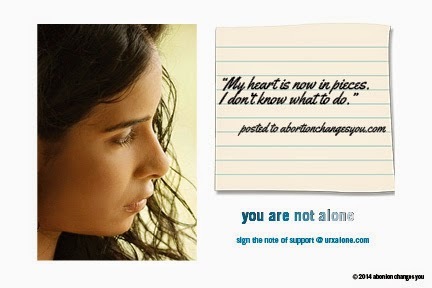 Through May 31st, Abortion Changes You is running a campaign called "You are not alone." The concept is very simple. Go to urxalone.com and sign the open letter to people who are struggling with a past abortion. The message is short and sweet: "If you are hurting, I want you to know that I care. You are not alone." Their goal is to get 5,000 signatures. This is not a petition. It is a direct message to someone who may be experiencing the darkest moment in his or her life. Think back to the worst day of your life; now imagine finding a message from 5,000 complete strangers, tailored to your exact situation, giving you love and encouragement. Pretty awesome, right? The Secular Pro-Life facebook page alone has over 5,500 fans, so this goal is very doable. Please, take two seconds to sign your name at urxalone.com. And then spread the word!